Located in the centre of the country, in July, Kathmandu, the capital of Nepal hosted a successful National Para Tournament; more than 100 players competed, the event being recognised as a competitive sport by the government for the very first time and included in the inaugural Para National Games. Both prominent players and newcomers travelled from Biratnagar, Dang, Dhangadi, Kathamndu, Pokhara and Rolpa to compete. Notable names on duty but there were surprises. Lok K.C. and Puja Soti arrived as beginners, against all odds, both won gold medals. Lok, 30 years old, comes from a remote area of Nepal, he had never played in standard conditions before and upset the odds in more than one way. Playing with a broken racket he won the Class 9 title! Equally impressive was his female counterpart, only 9 years of age, Puja Soti was the revelation of the tournament. She only began to play table tennis six months ago, despite the lack of experience; she remained unbeaten to win Class 7. The organisers were pleased with the number of participants and the geographical representation; all parts of Nepal were covered. The tournament was also an opportunity for players of the “Table Tennis for NepALL” project to show what they have learned in the last two years. Understandably, there were many challenges for the organisation; they had to organise the hotel and the competition area so it was accessible for the Para athletes. Determined, they solved all problems and made everyone feel welcome. Doubtless, this was a great experience for the athletes and the organisers, who are now prepared for bigger challenges. 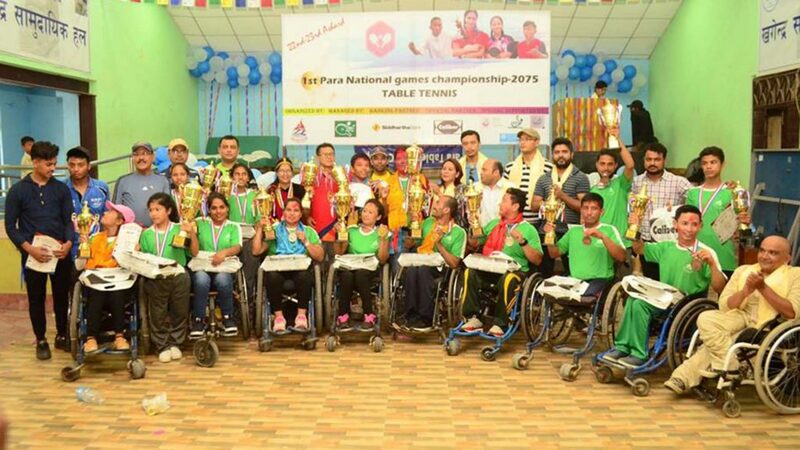 Since the implementation of “Table Tennis for NepALL” in 2016, one of the objectives was to establish regular para table tennis tournaments in order to promote empowerment, awareness and inclusion. We have now seen a successful integration of people with a disability into the community.